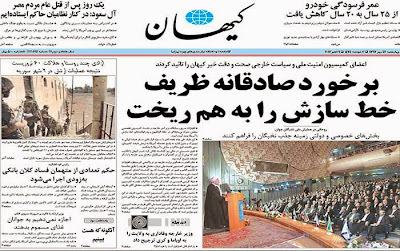 Kayhan, in a front-page report published on its Wednesday’s edition, dismissed foreign minister Zarif’s denial of its earlier report on the criticism of the supreme leader of his meeting with Kerry and Rouhani’s phone conversation with Obama. We had reported in our earlier post, that there were speculations in Tehran that Kayhan would stick with its original story, and it did. Below are the English translations of the key paragraphs of Kayhan’s latest report on the growing controversy inside the country on Rouhani/Zarif diplomatic initiatives during their trip to New York. “On Sunday, Mohammad Javad Zarif was invited to brief the national security committee of Majlis on the government’s diplomatic initiatives during the New York visit. 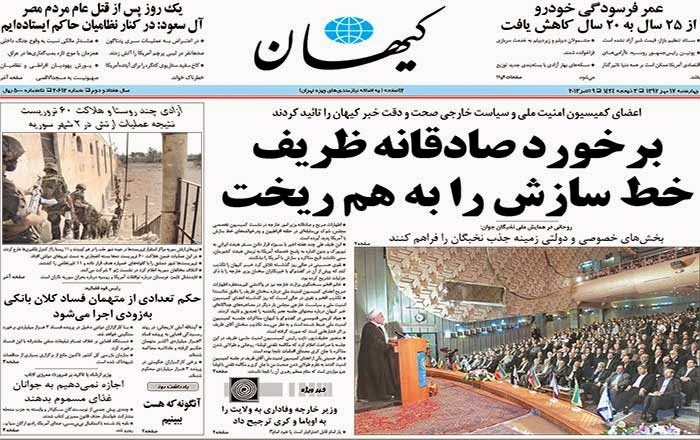 Photo credit: the front page of Kayhan, 9 October 2013.